Today, lets learn how to do this. Step 1: Select the column from which you want to hide. Step 2: Press CTRL+Shift+Right Arrow to select all the columns till XFD. Step 4: Select the row from which you want to hide. Step 6: Hide the rows too. And you are done! On cells where there are no formula, will removing the displayed cells improve performance? Will not displaying a few million cells each time have a performance perk, similar to the boost VBA application.screenupdating gives or does it still process the cells despite not being displayed? Is there a way to prevent scrolling after you have hidden all of the unnecessary rows and columns? How do I unhide now? I use these all the time. Have them set on the Quick Access Toolbar. Note: just have the bottom right cell you wish to show selected at the time of invoking the VBA code. This is a great tip. It's funny how few people do this and leave all the blank rows and columns when there is no way they are going to need them. There's one tip I REALLY wish someone could help me with, also has something to do with endless columns and rows. Sometimes it happens that you accidently edit all the cells in a certain row\column, causing you scrollbar to become really small and scrolling becomes very sensitive. Oops.. you need to clean all as there may be some blank values too. Right click your page tab and select properties. Set the scrolling limit to whatever you'd like!! I don't see a "Properties" option when right clicking on a tab. Where else might we find this Scrolling Limit option? In Excel 2010 (and 2007 I think), you can use ALT-F11 to open your VBA window. Select the sheet you want in the Project window and use F4 for the Properties sheet. In there you can set the scroll area to whatever you want. As a side bonus - the last parameter in the Properties sheet is Visible. If you want to really HIDE your sheet - you can set the property to VeryHidden. For lesser experienced Excel users, they will not know the sheet exists even if they right click on the sheet tabs to see Unhide Sheets. Not a foolproof way to hide sheets from experienced users but it can keep your more inexperienced users out of trouble. Thanks for the tip, I can think of several ways of applying it. However, it still doesn't make the scroll bar "normal" size again [chandoo, neither did the "clear all"]. This is an issue I find many people in my office asking me about and has yet to be solved. Any other suggestions? Is all your data for the worksheet visible on your screen? If the answer is Yes, then the large scroll bar is actually the correct size. I had tryed that many times and with no success. As you scroll further down in the sheet the the scroll tab (for lack of a better name, not sure that's what it's called) gets smaller and smaller. If you don't do anything and go back to A1 the tab becomes big again. If you do edit the cell the tab remains small. After going back to the cell and deleting or "clear all"ing 😉 it and then going back to A1 nothing changes and the tab remains small. As far as I know, this is also the case with my team memebers. Here's the method I use to reset my scroll bars. 1. Go to last cell I actually am using. 2. Select all rows/columns below/to the right of where I am. Hope this magic works for all my other sheets as well. Thanks for your valuable tip. Excellent tip, how do you unhide those rows, if you need to. Then while keeping mouse clicked, drag it down as if you are selecting more rows (columns) in to the blank area. Then right click and unhide. Thanks Chandoo, i was also wondering. That is SO simple and so effective, I feel like an idiot that it's never occurred to me before. Not an utter and complete idiot, for at least I'm smart enough to subscribe to Chandoo.org! Simple and easy to apply. i will try it right now. thank you for your tips. Chandoo, this is a great tip. I used to just remove the gridlines and make reports thinking thats the best way. This is a step ahead and gives a clean look. Thanks. how to hide Row & col lables? In Excel 2007, choose the View tab on the ribbon and unclick "Headings". Do the same for the rows ! Why do we need to keep holding the shift key? Hide is one of the normal choice in the right-click menu. Does this increase the size of the file? It wouldn't affect the size or if it did it would be very insignificant. If I am hiding rows and columns, in all 10 sheets, from U in column and from 40 in rows then size of file is increasing to 10+MB . is there any problem in my file or this is usual/common ? The file size depends on what excel need to store in it. Since you are not actually removing anything from the sheet, but simply not showing it, the file size does not shrink. Chandoo: Thank you very much for this treasure trove! It has become the first place I go when I need to find info on anything excel-related. Hi Chandoo! Thanks so much! I have often wondered how some Excel files that I've downloaded from the web have this clean look--with no extra rows and columns. Now I know, thanks to your tip! This is awesome. I have already begun using this on my spreadsheets at work! what if it is the other way, column A-W is hidden, how to unhide all column instead ofcolumn by column. This was helpful in getting rid of unnecessary columns, but im typing a spreadsheet and when i get to the end of one row and push "tab" to start the next row, it will not tab down to the begging of the next row.. is there a way to adjust this? Hi Annie.. can you press Enter in the last column. This should bring you back to first column next row. This is a great tool. I use borders on my spreadsheets. I noticed that after hiding all the rows and columns, the last columns in my spreadsheet lost its border and now the spreadsheet looks odd with no right-hand border. Is there a way to fix this or protect the border when hiding the unnecessary columns? Thanks! format a right hand border on your last column - not a left hand border on the first hidden column - it should show nicely. I have created a data base with more than 350 columns. When trying to open the file again, only the first 256 columns showed and everything else was gone/hidden. I've tried with any unhide option and nothing worked so far. Any suggestion? want to learn vba . how i need to get started....? Thanks. Your post helped me a lot. 20 websites later, I should've looked at yours first. THANK YOU! Ahhhhhh Why was this so hard to find? OHMYGOD YOU can't imagine the HUGE knot you've just outdone in my brain. all these columns...i don't need them, please go away...how how HOW DEAR LORD???? these measly appreciative words are not enough. THANK YOU!!! This is cool but I want to do exactly the same on the left hand side of the report. I want to have a A4 page like report in the centre/middle of the screen. So while your solution does it beautifuly for the right hand side of the report and for the section underneath it too, how to do it on the left hand side? Hidding columns won't work there. is there any other way? OK! Thanks! I got the point! Thanks for the tips! If you need to unhide the rows and columns, first select the entire sheet. Then, in Excel 2003, choose Row or Column from the Format menu and select Unhide. In Excel 2007, click Format in the Cells group on the Home tab, choose Hide & Unhide, and select Unhide Rows (or Unhide Columns). how many rows and columns on 2013? How would I quickly hide all the columns EXCEPT: 5, 123, 287? Oh thank god I found you. Do you know how many websites I went through for this simple little fix? How is the search engine not figuring out when I say "I only want to see Page 1 in Excel" that I only want to see Page 1? You're a lifesaver! On my version of excel the background color of the hidden area is white, not grey... so no difference between the hidden area and the work space... is there a fix? Cheers. How to do this in Office 2016 for Mac, any tips? Thank you! 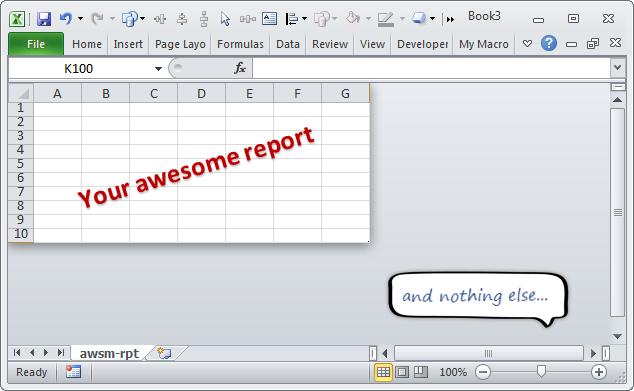 A clear, simple answer to surely a common problem for the amateur excel user. Couldn't find it elsewhere. Appreciated. But there is no way to make the form do this automatically without having to select the fields each time? be a great author.I will ensure that I bookmark your blog and may come back later on. I want to encourage you continue your great work, have a nice weekend! Great. Thanks a lot. I was searching for this from 1 month.